NHL News : Breaking: The NHL hits Nazem Kadri with a HUGE suspension! Breaking: The NHL hits Nazem Kadri with a HUGE suspension! Kadri hit with a massive suspension. The National Hockey League's Department of Player Safety has thrown the book at Toronto Maple Leafs' forward Nazem Kadri, suspending him for the duration of the Leafs' first round series against the Boston Bruins, but by now it is something that just about everyone should have seen coming. This means that Kadri will serve a minimum of three games or a maximum of five games, depending on how long the series goes. 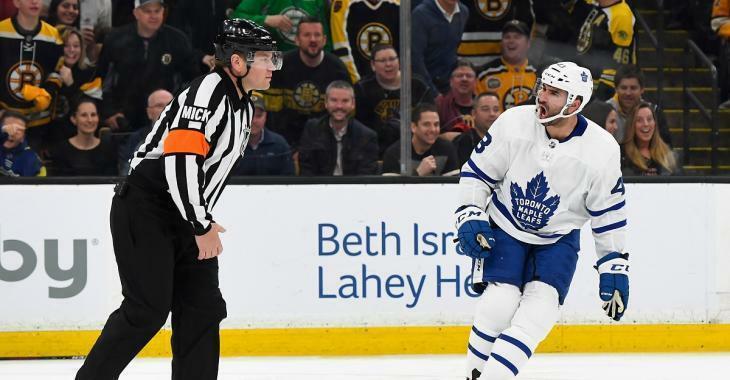 Kadri of course has been suspended for a vicious crosscheck he delivered to the head of Boston Bruins forward Jake DeBrusk during Game 2 of the first round playoff series between the Boston Bruins and the aforementioned Maple Leafs. It marks the second time in as many years that these two teams face off in the first round of the playoffs, and unfortunately for Kadri and the Leafs it also marks the second time he has been suspended during the first round as well. For those of you who have been living under a rock and have somehow still not seen the crosscheck that got Kadri in so much hot water over the week end here it is. Unsurprisingly it was announced that the National Hockey League's Department of Player Safety would be reviewing the crosscheck from Kadri and that he would have a hearing for his infraction. What may have caught some fans off guard however was the news that the hearing would be held in person, at the league's head office in New York City, a condition that is usually reserved for players who are going to be suspended for 5 or more games. That being said given Kadri's history of illegal hits to the head, and a history of suspensions that have followed those hits, perhaps it should not have been such a big surprise. For example, here is the hit to the head of Bruins veteran Tommy Wingels that saw him suspended last year. This of course a tremendous blow to the Maple Leafs hopes for the first round of the Stanley Cup Playoffs and it is also the second time in 2 years that Kadri has dealt such a blow to his own team and teammates. It is so bad in fact that earlier today TSN insider Bob McKenzie strongly hinted at the fact that this could be the end of Kadri as a Maple Leaf.